This interesting surname, found as Amos and Amoss, is of French or Biblical origin, and has two possible sources, each with its own distinct history and derivation. Firstly, it may be derived from the Old French given name or nickname "Amis" (the oblique case being "Ami"), Friend, from the Latin "amicus", itself a derivative of "amare", to love. The word "amicus" was used in the Late Latin as a name for the lower classes, especially slaves. The name was introduced into England by followers of William the Conqueror after the Norman Invasion of 1066, and the first recordings of the surname is from this source (see below). 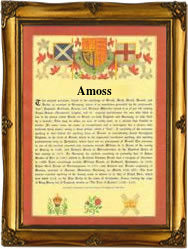 The second source is from the given name "Amos", which is derived from the Hebrew "Amos", "Borne (by God)". This was the name of a prophet of the 8th Century B.C., whose oracles are recorded in the Book of Amos from the Old Testament. However, Amos is not found among non-Jews before the Reformation in the 16th Century, and so the English surname is unlikely to be derived from it, except in individual cases. Recordings from London Church Registers include: the christening of Charles, son of Thomas Amos, on December 10th 1659, at St. Benet's, Paul's Wharf, and the christening of George, son of George and Mary Amoss, on July 23rd 1721, at St. Olave's, Southwark. A Coat of Arms granted to the family is described thus: Potent counterpoint gules (red) and argent (silver) a chevron or (gold); the Crest being a square collegiate cap sable (black). The first recorded spelling of the family name is shown to be that of Robert Amis, which was dated 1221, in the "Abbey of Ely Records", Suffolk, during the reign of King Henry 111, known as "The Frenchman", 1216 - 1272. Surnames became necessary when governments introduced personal taxation. In England this was known as Poll Tax. Throughout the centuries, surnames in every country have continued to "develop" often leading to astonishing variants of the original spelling.